Show your pet's true life features with a personal pastel portrait. Dog owners consider they’re pets as “part of the family”. They are loving, loyal, forgiving. As dog owners ourselves, we treasure our favorite moments with our pet, and will cherish them forever with custom dog portraits. Cats may be a bit crazy but you love them anyway. Send in a photo of your favorite cat and Mechelle will hand create a custom cat portrait in pastel paints that you or a loved one will proudly display and cherish and enjoy forever. Are you out of wall space but want to memorialize your cat or dog? Custom painted dog and cat sculptures make a perfect gift for dog owners, cat owners and even to memorialize a loved pet after they’ve passed. The perfect gift for any pet owner! Mechelle Roskiewicz has created pastel dog and cat portraits for the loved pets of some of Hollywood’s most famous stars. Her award winning artwork hangs in the museum of the Kennel Club of England. For the holidays or any special occasion I create custom hand painted ornaments with a portrait of your favorite pet. I use acrylic paint on 4″ frosted glass balls to create a keepsake that you can treasure. 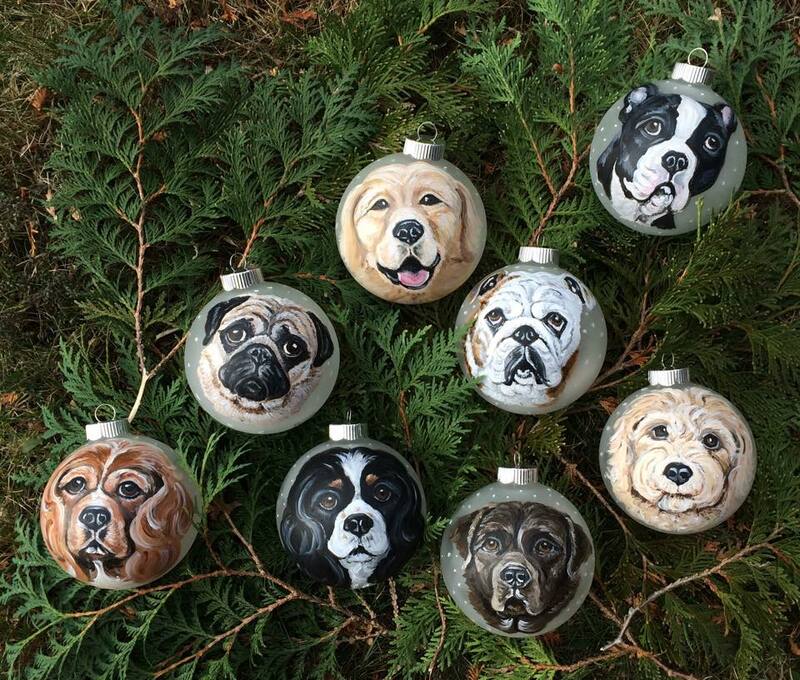 These ornaments make a great gift for family, friends, or anyone who loves their pet. Each ornament is detailed and personalized using your favorite photo. All ornaments include a bow ribbon and gift box. We also have Pre-made Ornaments for certain breeds. Show your dog's true life features with a personal pastel portrait by Mechelle. By sending us a photograph of your dog, we are able to create a one of a kind pastel portrait that you or a loved one will cherish and enjoy forever. © Copyright Loved Dogs Art. All rights reserved.